C-Line's vast array of shop ticket holders puts everything in perfect working order right at your fingertips-or wherever it needs to be. The strong, rigid and clear vinyl design allows for easy visibility of any type of documents. Each holder has a convenient hole at the top so you can hang information where it makes the most sense for you and your business. The holder includes a Velcro flap closure; the design will help contain all your documents safely in the holder. The holder is outlined with reinforced black stitched edge, providing a longer product life. The expandable, gusseted feature is capable to hold up to 150 sheets with the insert size of 9 x 12 x 1". Perfect for a number of uses in manufacturing, auto repair, inventory control or anywhere else records need to be kept closely and protected. Insert Size: 9 x 12 x 1"
Create folders out of a clear plastic that will not split and crack after being exposed to temperatures below freezing. No one warned us these do not hold up in winter, lost 50 that year. 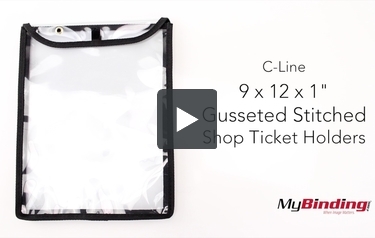 This is C-Line 9 x 12 x 1 inch Gusseted Stitched Shop Ticket Holders! It’s a clear pouch with a velcro wrap-around opening, and it has plenty of space to fit a lot of paper or even whole books, binding and all. Opening and closing the holder is easy with the velcro closure. It has a metal eyelet so you can hang it, but only when it is open. Everything fits nicely within it because it expands to 1”. And here is just a nice final look at the product.